I arrived a full half hour before the group for our second stop on our pilgrimage of sacred spaces. It was early Tuesday morning and mass was being said at Detroit’s St. Joseph’s Oratory. 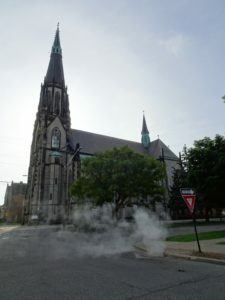 The church was built in Detroit’s Germantown in the early 1870’s and was a clear reminder to one and all of the churches back home with its 200 plus foot high spire and Gothic Revival ‘Hall Church’ plan in which the ceiling above the side aisles rises almost as high as the nave of the church. The majestic heights of St. Joseph enable the original stained glass from Meyers of Munich to truly shine. In the long arduous days of industrial Detroit the workers must have found true rest as the brightness of the place warmed them with memories of home. With more than sixty carved sculptures they would have been surrounded with encouraging reminders of the great cloud of witnesses who were still close even though they were so far from home. The steeple which is currently damaged caused the church to be closed for a few months in 2016, but the money has been raised and the work will be accomplished this summer. At its opening the church was the tallest building in all of Detroit, but even then there was trouble with the steeple. At the time of installation the heaviest bell broke free of the pulley that had raised it to the belfry causing it to crash through multi levels of flooring beneath and then shatter completely upon impact on the ground. Undaunted the founding priest simply ordered a replacement bell weighing an additional ton. 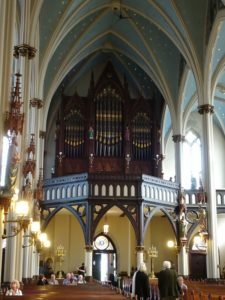 Since 1872 the building has stood as a reminder to one and all to look up in faith and tune their hearts to the true notes of heaven. Pulleys were also used at the opening of the church to raise orchestral instruments into the gallery to provide a symphonic mass to the chagrin of the residing Germanic priest whose intent was to not only provide a sanctuary to transport the people back to the fatherland, but also the purer music of the Gregorian chant as opposed to more modern sounds. This only goes to show that the so-called ‘worship wars’ go further back than most realize. St. Joseph’s is known as an Oratory because it is one of the places where the Tridentine or Latin Mass is offered. I was unaware of this when I arrived early that morning in time for mass. 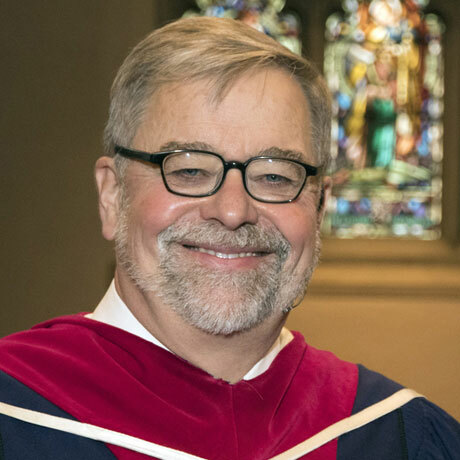 While I am equipped to identify the theological shortcomings of the Latin Mass from a Protestant perspective, I had never experienced its beauty and drama. To be there as the priest turns his back on the people and speaks to God in a language familiar enough yet beyond us, rising and kneeling, crossing himself and kissing the altar, with the Sanctus Bell ringing again and again and again at least ten times was intended not to transport the worshippers back to Germany, but to their true home which is not of this world. 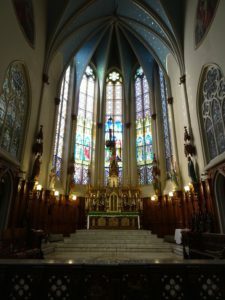 Gothic architecture has the same intent and so the building and the mass were one in their purpose to comfort the people with the bread of heaven which has come into the world in Jesus Christ. We were blessed to be welcomed so warmly as Protestants from the other side of the border, most of whom didn’t know much Latin or German, but who believe deeply in the same Christ and know that he is our true home.